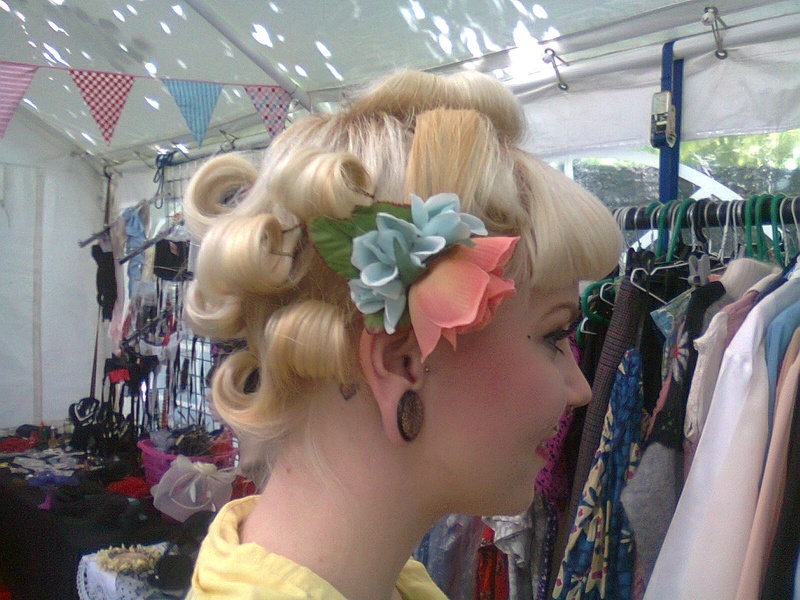 We'll create a wonderful 40's hair styles andyou'll still be able to afford that dress you wanted. We manufacture one off designed 40s style hats for rock bottom prices. Our hats are finished to a high standard and we have a wide range of styles so you are sure to find one that will suit you or even two. We have many cstomers that visit our stall at different events up and down the country to expand their collection of our hats. We Have dresses and accessories to make sure you get noticed and can advise on vintage style that will suit your look. Fashion in the first half of the 1940's was governed by the availability or more accurately the lack of materials. This was particularly true in the UK and Europe. In America materials were more freely available and so constricted designers and manufacturers less. at least this was true before America entered the war. December the 8th 1941 the day after the attack on pearl harbour in Hawaii. The USA was the only country involved in WWII to become richer as a result. The American fashion reflected this. U.K fashion was greatly restricted by rationing and lack of materials. many women in the 1940's had more developed making skills such as knitting sewing etc. Patriotism and the much promoted austerity led to creativity and initiatives that used little materials and recycled much of what was available about the house. British women wore smaller hats, made their own clothing, patched and repaired old clothes, and worked in industrial environments. All of this influenced British fashion. Clothing was made using As little material as possible but it was also widely recognised that women’s' looks were instrumental in maintaining high moral among the population not least of all among the women themselves. A slim elegant style evolved as a result, Hair was worn high on the head in roles and waves and held out of the way with nets (Snoods) or turbans and wrapped around scarves and rats. the fashion for wearing hats was wide spread throughout Europe and the USA. in Paris large hats were popular verging on the ridiculous.